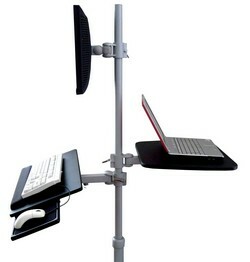 Add a Pole clamp-on Shelf to a 35 mm diameter pole or to any of our CUZZI DVC Pole carts, such as the DVC03, DVC02 or your customized DVC02-BYO Pole Computer Worksation. 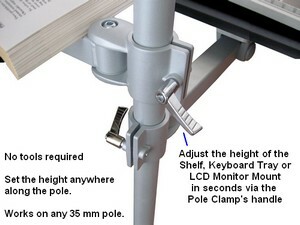 Simply slide the shelf onto the workstation's pole or to a 35 mm. diam. pole (1 3/8" diam). * NOTE: will only work on 35 mm. poles. Please measure your pole's diameter before ordering. Easily choose the height along the pole and then secure it by tightening the clamp using handle on the clamp's handle screw. No tools required. The shelf swivels 90 degrees to each side and also rotates 360 degrees around the pole. Includes one cable management clip on the pole bracket. 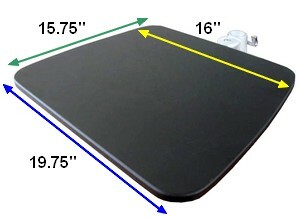 Shelf Dimensions: Front Width 19.75"; Rear Width 16"; Depth15.75"
Use it to hold a printer, scanner or as a laptop pole shelf. 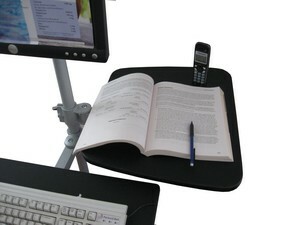 Also used for medical devices or simply to achieve extra portable writing space. 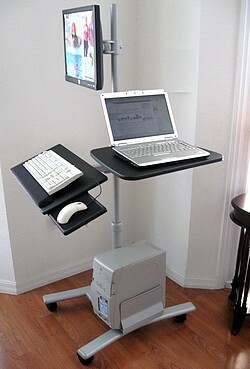 Below you can see the DVC03-SH pole-clamp shelf attached to the CUZZI DVC03 Pole workstation, used as a laptop shelf.